Steel frame and T Bar style legs with powder coated charcoal finish. 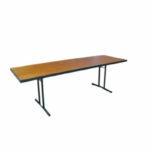 Easy to clean commercial grade plywood top with lacquered finish. 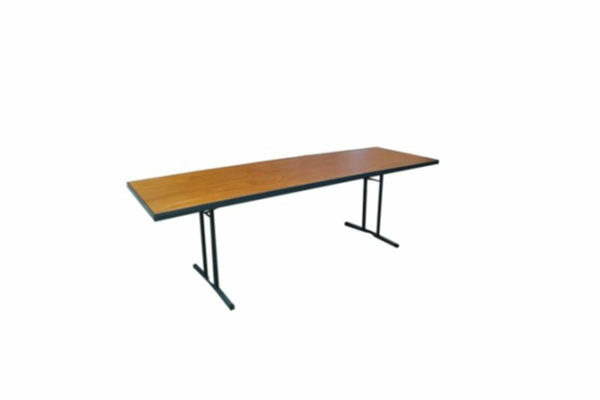 Tubefab tables have been trusted for over 30 years in their current design in NZ and Australia with proven performance in heavy usage situations. 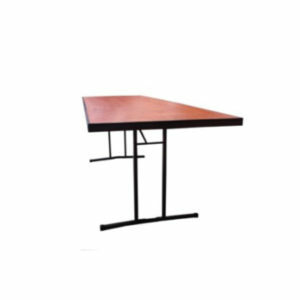 Square corners are safely rounded to prevent catching on clothing and table cloths while allowing tables to be beside each other and using the full width of the table join. Table top edges completely encased in steel – top is protected from dropping the table and fracturing the plywood top. Heavy construction – won’t blow away or be easily knocked over. Made from start to finish in Christchurch using quality raw materials from local suppliers and delivered to you from our Central Christchurch factory. 15 year, non-commercial, return to base warranty on workmanship and materials.  If you are a volunteer, part of a not for profit group, a school, church or a sports group please get in touch via email (info@tubefab.co.nz) or 0800882332 (0800TUBEFAB) and we will sort special pricing for you. We love volunteers and want to help those who help and support others. Easy to use - legs automatically lock into place when opened - no fiddling around with catch’s or latches to hold the table up, a simple push sideways releases the stay rod to fold the table. 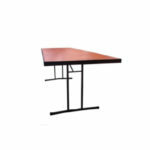 Integrated Legs - legs are integrated into the table frame and don’t have any separate hardware to hold them together- they will never loosen, seize or get out of alignment making this a maintenance free table. 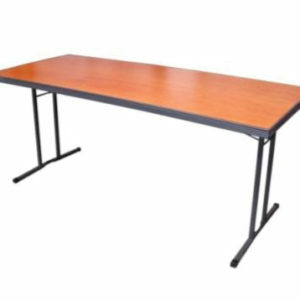 Maximise seating space – down each side of the table you can squeeze as many in as possible without the legs getting in the way and one person on each end of the table wont have any problems getting comfortable with the leg position. 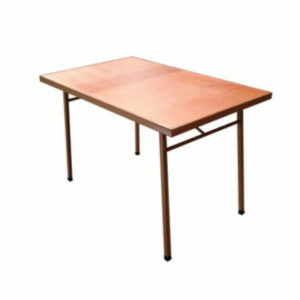 Customisable Tops - tops are easily changed with 3 Phillip’s head screws to undo – slide the table apart horizontally and either turn over the top or replace with another piece of ply and push back together again.